Mr. Yoshinari Kawai introduced himself in a letter he wrote to Mr. Harbin on January 16, 1990. He stated he was a member of the NFLCC and about eight years ago when he was 17 years old he learned of the Bassman from a Japanese magazine called "Fishing". Mr. Wakabayashi wrote a series of articles on Old Tackle for the "Fishing" magazine which Mr. Harbin supplied Mr. Wakabayashi with Heddon lures, 35mm color slides and ID information to use in his Old Tackle Stories. 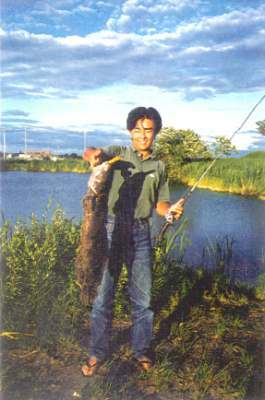 (left photo) Mr. Yoshinari Kawai was 24 years old when he caught this Snake Head fish in the summer of 1987. The Snake Head fish measured 90cm (3 feet) in length. Mr. Harbin mailed Mr. Kawai a copy of Old Fishing Lures and Tackle book by Carl Luckey per his request. He also sent two lures one new in the box Heddon River Runt and a Heddon Stingaree both as gifts for Mr. Kawai. Mr. Kawai traveled to Los Angeles, California for a sightseeing and lure hunt vacation in February of 1990. At that time he had the opportunity to meet Mr. Rick Edmisten and view his collection. Mr. Kawai said the next time he traveled to the United States he would like to meet Mr. Harbin and view his old lure collection. 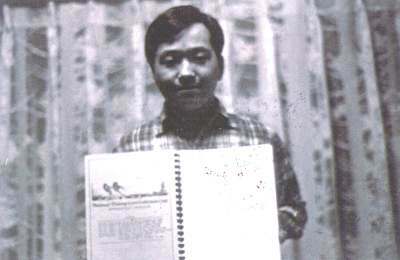 Mr. Harbin sent Mr. Kawai a map to his home and asked him to notify him when he planned to travel to the US and he would set up the visit for him at his home in Memphis, Tennessee. Mr. Kawai wrote Mr. Harbin on January 21, 1991 and said he had copies of his Heddon video's volume 1 through 5 and was looking to purchase volumes 5 through 8 to complete his Heddon video library. Along with this letter he mailed Mr. Harbin two Heddon/Smith lures (#140 SOS and #6400 Zaragossa Jr.) both new in the box as gifts. 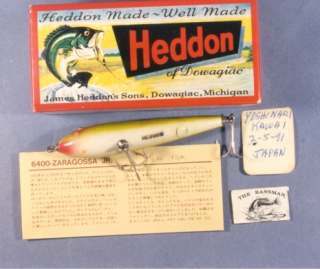 The Heddon/Smith lures were made by Heddon for the Smith Co. Ltd in Japan. The Smith company made a request that Heddon special make them the Original Zara Spook, Magumum Torpedo, Baby Zara, Wounded Spook, Lucky 13 and the Zara II lures in the colors that were used when they were first released. 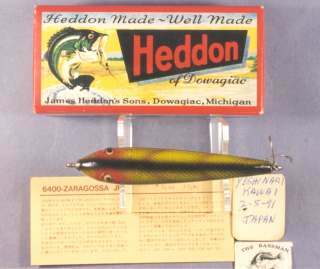 The Heddon/Smith lures were only available by the Smith Company in Japan and were not sold in the United States. 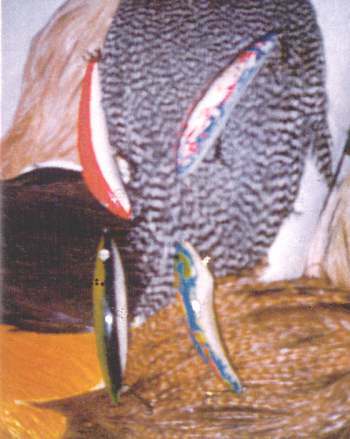 Heddon made these lures for the Smith Company until 1983. November 11, 1983 the Edwin B. Stevens Company purchased the Heddon Company and made it a division of the PRADCO then they moved the entire operation to Ft. Smith, Arkansas. AboveTranslation: Heddon Old Favorites * Heddon has manufactured baits for nearly 100 years. 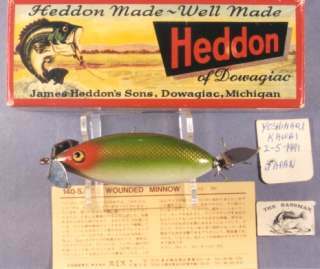 The Heddon company was founded by James Heddon, who lived in Dowagiac, Michigan, and enjoyed bass fishing during his youth. Mr. Heddon became interested in the construction of artificial lures and began manufacturing his lures for the world in 1898. The first bait ever made was a top water plug that imitated a frog. The bait was called the "wooden frog". Since then, bass fishermen have received a great deal of enjoyment from catching bass with an artificial plug. As a result, Heddon has re-introduced a few old favorites to evoke this spirit to the Japanese fisherman. Please reference the following information regarding the S.O.S. Wounded Minnow, The Zaragossa Junior, and the Midget Crab Wiggler. Above Translation: 140 S.O.S. Wounded Minnow * The S.O.S. Wounded Minnow is a remarkably popular Heddon top water bait. As the plug is retrieved, it resembles a weakened fish struggling at the surface of the water. The bait was originally introduced in 1928 (4/5oz and 3/5oz sizes) and was made with a cork body. In fact, the original design even used the feather of a bird to decorate the tail hook. 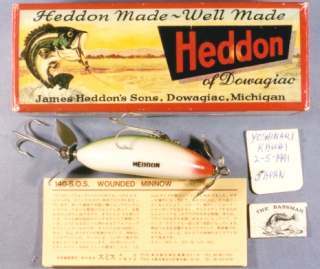 In 1937, the demand for a smaller size bait was met and the 1/2 oz size was added to the Heddon catalog. To fish the S.O.S. Wounded Minnow, retrieve the bait slowly with short jerking motions causing the propellers to "splash" resembling the sound of a wounded fish. Today, with the re-introduction of this plug, it will surely play an important role in Japanese bass fishing. And of course, it is made with a glass eye indicating that it is a genuine Heddon bait. Above Translation: 6400 Zaragossa Jr. * This is a junior edition of a lure that was made from 1922 to 1953. Although Heddon has a superior lure history, this plug has yet to be disclosed to the world. At first, it was doubtful if a pencil bait could be sold successfully, however the Zaragossa proved to be a wonderful fish catcher. 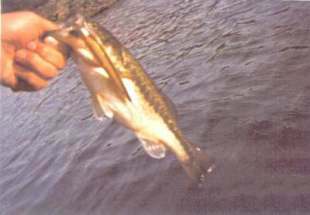 The size of the plug is similar to that of minnows found in Japanese bass ponds. The slim body is tapered and weighs 1/2 oz , perfect for the Japanese baitcaster. It has been found that the junior version of this lure will work better with today's new rods and reels than the larger and heavier original design. As a result, Heddon has succeeded in manufacturing a plug exclusively for the Japanese fisherman. The bait is made from quality white cedar and displays a genuine glass eye. Above Translation: 1950 Midget Crab Wiggler * This re-introduced Heddon plug is similar to the old wooden plugs of yesterday. 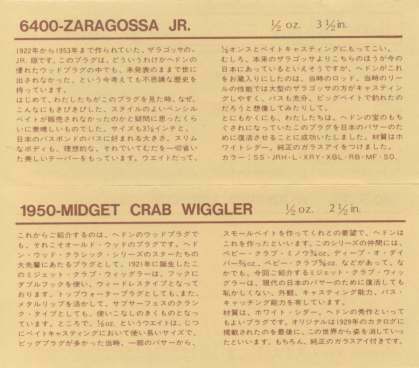 The Midget Crab Wiggler was first manufactured in 1921 and comes from a long line of successful crab imitation baits. The top water plug uses a double hook and weights 1/2oz. Upon retrieval, the bait makes use of a metal color at the line tie to achieve excellent subsurface action. The demand for the Midget Crab Wiggler comes from the days when much larger plugs were plentiful. Heddon listened to the bait fisherman and created several handy sized lures: the Baby Crab Minnow (3/4oz), the Deep-O-Diver (2/3oz), and the Baby Crab (5/8oz). Heddon has now re-introduced the Midget Crab Wiggler for the contemporary Japanese fisherman. The plug's appearance, casting ability, and bass catching ability is similar to other plugs in this series. It is made from white cedar, and of course, it is fitted with a genuine glass eye. February 5, 1991 Mr. Harbin replied to his letter and sent Mr. Kawai volumes 5 through 8 of his Heddon video tapes all as gifts for him. He thanked Mr. Kawai for the two Heddon/Smith lures and tagged each lure as a gift from Mr. Yoshinari Kawai. Mr. Harbin proudly displayed the gift lures in his Heddon collection. 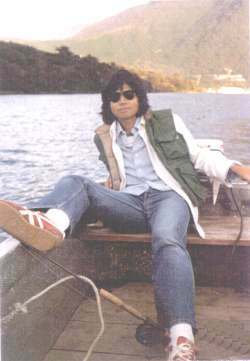 Mr. Yoshinari Kawai was a fine young Heddon collector and good old lure friend to Mr. Harbin. It was very sad news to hear of his sudden death from a brain tumor in 1993/94. Mr. Yoshinari Kawai had a short life and is missed by his family, friends and all that knew him. Translation: "Thank You For Your Attention"
The translation is the courtesy of Mr. Hiro Naito. Mr. Hiro Naito is a representative for the Plastic Research & Development Company (PRADCO) for Japan. January 14, 1981 Mr. Masamichi Yamada (left photo) wrote a letter to Mr. Harbin and thanked him for the terrific Christmas card that he sent him. Masamichi Yamada is an old lure collector and a very good bass fisherman. 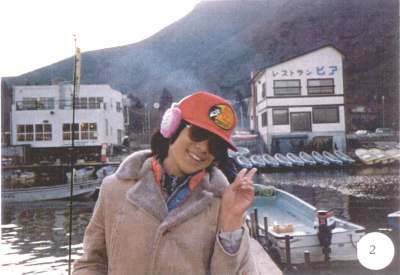 At the early age of twenty he set a goal for himself to become the 1981 champion bass fisherman of Japan. He reported to Mr. Harbin that last year he had a poor year fishing but some of his fishing friends had much better luck and caught some very nice fish. He sent along pictures of his fishing friends and a brief history for each picture. Mr. Harbin told Masamichi Yamada to become the champion fisherman one must believe in oneself. Confidence and good lures makes champions. He wished him good luck and success in becoming the 1981 Japan Champion. (left) Mr. Hiroshi Yamazaki - In this photo Mr. Hiroshi is 18 years old. 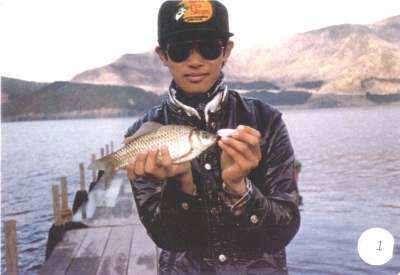 He is the 1980 Junior champion on Lake Ashinoko for angling a 15-3/4" Rainbow Trout. Mr. Yamazaki is holding a fish called "Funa". The Funa belongs to the Carp family. 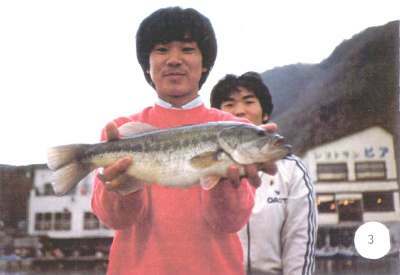 (left) Mr. Osamu Inoue - Mr. Inoue is 16 years old and is the Third place 1980 Junior Champion for Lake Ashinoko. He angled a 15" Bass he caught with a minnow type lure. (left) Mr. Mineki Adachi - Mr. Adachi is 21 years old. He is the 1980 Champion for his University's Fishing Club. He angled this 16" bass and caught another 15" bass the same morning. He also caught a 16-1/2", 18-1/2" and 20" Brown Trout. 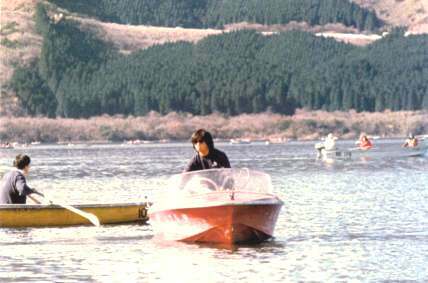 Mr. Masamichi Yamada is motoring the red boat on Lake Ashunoko. There were many fishermen fishing that day on Lake Ashunoko. 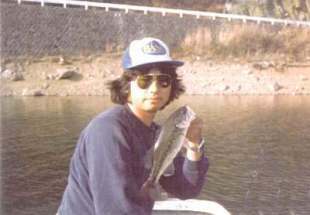 Mr. Masamichi Yamada caught this 17-3/4" bass June 23, 1982 with a plastic worm on Lake Ikehara. Mr. Masamichi Yamada landed this 19-1/5" bass September 20, 1982 on Lake Ikehara. He was using a chartreuse spinner bait when he caught this nice bass. Mr. Harbin and Mr. Yamada swapped fishing techniques with each other and which lures were their favorite. Mr. Harbin explained that he prefers the surface noise lures such as the Buzz baits or the Lucky 13 lures. He sent Mr. Yamada four or his own design spinner baits with instructions for him to fish with. Mr. Yamada said he prefers to fish silent lures and one of his favorite baits was the Heddon Zara Spook. (left photo) Mr. Masamichi Yamada sent pictures of some of his lures that he handmade himself. These four beautiful handmade lures are low noise lures. 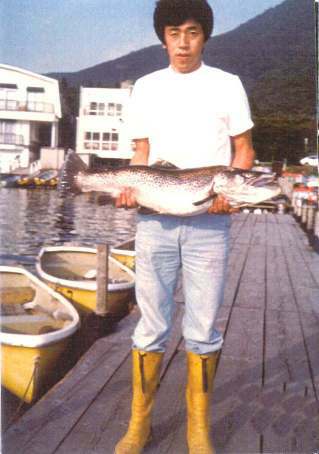 (left) Mr. Hiroshi Tokunaga set a new Japan record with this Brown Trout he caught on Lake Ashinoko June 18, 1981. The record was broken by this 30 3/4" and 14 1/2 pound Brown Trout. It took Mr. Tokunaga with the help of his brother 15 minutes to land this fish. He was using a Super Striker rod, Ambassador 2500 reel, 12 pound test line and a Bagley Small Fry lure as bait. Mr. Tokunaga is standing on the pier of Lake Ashinoko Fishing Center. The fishing center has a Restaurant and a tackle shop which is owned by Mr. Motoh Ohba. The tackle shop sells all types of fishing goods, rents out leisure and fishing boats. Mr. Masamichi Yamada is an employee of the Ashinoko Fishing Center. His duties are to hire out and maintain the leisure and fishing boats. He also works in the tackle shop selling and stocking fishing supplies. 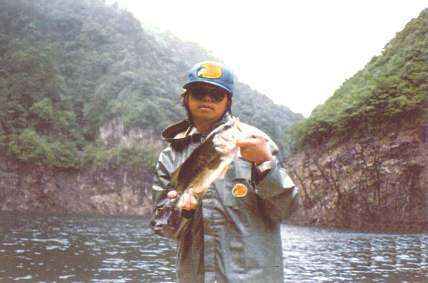 (below left) Mr. Masamichi Yamada caught this bass with a floating Rapala 13G on Lake Shoji. 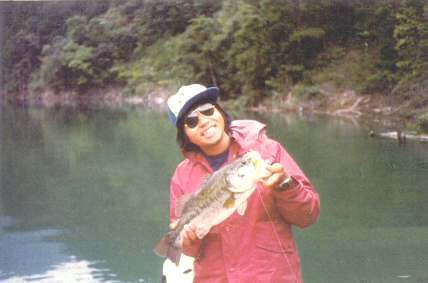 (below right) Mr. Masamichi Yamada with another bass caught on Lake Shoji in May of 1981. (above) Lake Shoji is in the foreground which is just one of five lakes of Mr. Fuji. 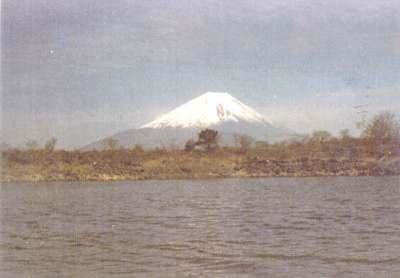 In the month of May snow covers the top of Mr. Fuji. The above two pictures are of Mr. Masamichi Yamada's son Masashi. 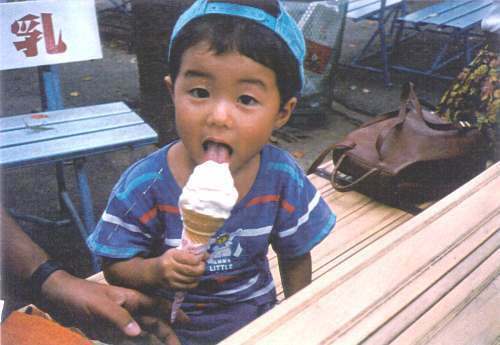 Masashi will be three years old on December 14, 1995. 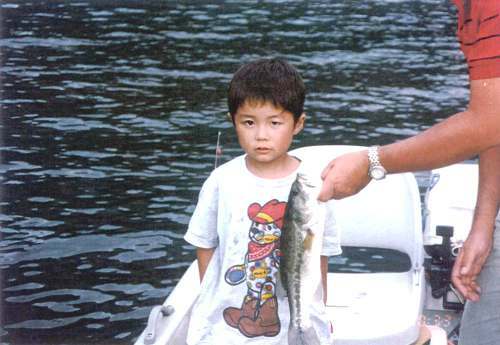 Masashi caught his first bass this past summer on Lake Ashinako, Hakone. His father took him fishing five times that summer. They fished the sea, then rivers, then inland lakes and young Masashi is turning out to be quite a good little fisherman. Mr. Kazuyuki Orii wrote Mr. Harbin on September 22, 1988 and reported that he learned of Mr. Clyde Harbin from Mr. Grits Gresham book titled "Complete Book of Bass Fishing". This is where he discovered the James Heddon's Sons Catalogues book by Clyde A. Harbin Sr. He expressed a strong desire for this book and asked for information how he could obtain a copy of his book. Mr. Harbin replied to Mr Orii letter and explained that the James Heddon's Sons Catalogues book was no longer for sale because of the 304 copies printed only 5 copies remain on hand. These copies are only available for trade of old fishing lures. Mr. Harbin sent Mr. Orii his information sheets how to obtain his Heddon video tapes and Carl's Luckey's Second Edition of Old Fishing Lures and Tackle. Mr. Orii was disappointed that the book was only available by trade of old lures. In a follow up letter Mr. Harbin explained that he has received many such request from US collectors and the condition for his book was the same for all. Mr. Harbin suggested that he purchase a copy of Old Fishing Lures and Tackle by Carl Luckey because this book had answers for the Heddon wood body lures he was looking for. Old lures are very difficult to find in Japan and written material on old lures is even more difficult and nearly impossible to obtain. Mr. Orii would not give up so he revisited all of the tackle shops, antique shops and made many long distance calls but he could not locate a copy of Mr. Harbin's book James Heddon's Sons Catalogues. He made a huge effort and spent a lot of time and energy searching for this book. He walked many, many miles looking and through his efforts he was able to find a few Heddon lures (#6400 Zaragossa Jr., #7500 Vamp, #8500 Basser, #6500 Zaragossa, #190 SOS minnow). Mr. Orii offered these lure to Mr. Harbin as trade for his book. It was now in December of 1988 and Mr. Harbin replied to the offer of trade and apologized for a misunderstanding Mr. Orii had but he could not trade his book for these lures. Because of Mr. Orii extreme effort and yearning for this book Mr. Harbin graciously made a copy of his book available to Mr. Orii. He also make some old Heddon lures available to him. "Well" to say the least when Mr. Orii received this letter and learned of this news he was overcome with joy. He thanked Mr. Harbin for his kindness and said what a joy it is! Mr. Orii was extremely happy that he finally was going to be an owner of Mr. Harbin's book James Heddon's Sons Catalogues. They both wished each other a very Merry Christmas and a Happy New Year. 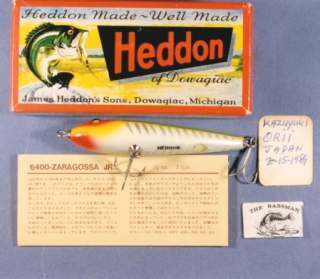 February 15, 1989 Mr. Orii sent Mr. Harbin a new in the box #6400 Zaragossa Jr. Heddon/Smith lure as a gift and said he would never forget the kindness that he received from him. March 1, 1989 Mr. Harbin sent Mr. Orii the information he was seeking for about the sale of the Heddon Company to the EBSCO (Edwin B. Stevens Company) in 1983. Mr. Harbin thanked Mr. Orii for the gift lure he received on February 15th. 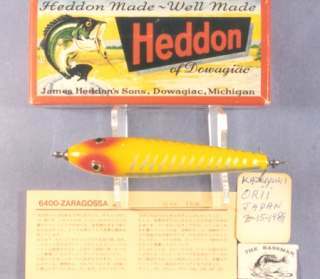 This Heddon/Smith lure was the only Zaragossa Jr. Mr. Harbin had in his collection at this time so he placed this gift lure in his rare Heddon collection case. June 27, 1998 nearly ten years later Mr. Orii wrote Mr. Harbin after reading the Old Tackle Story that Mr. Tsutomu Wakabayashi published in the "Fishing" magazine back in 1981 and 1982. He was so moved by the stories that he took this opportunity to write Mr. Harbin again. He told Mr. Harbin that he kept all the gifts, letters he sent him ten years ago and he will always treasure them. Mr. Orii inquired about the Heddon Historical Footprints book by Mr. Clyde A. Harbin which he shortly became a proud owner of a signed #147 copy of this book. Mr. Harbin also sent Mr. Orii a 1910 Heddon valentine Girl picture, Tadpolly girl picture, his personal Bassman lure collector patch and the first style Heddon Zara Spook all as gifts for Mr. Orii. 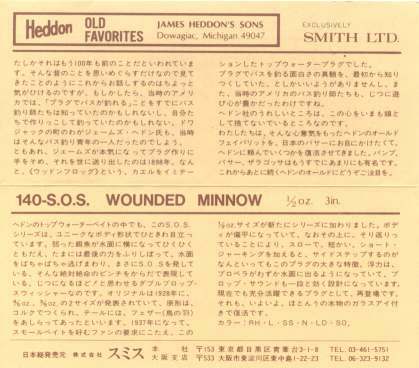 Mr. Koichi Yasui wrote Mr. Harbin in October 1980 to order a copy of his James Heddon's Sons Catalogues book. Mr. Yasui is thirty years old and is a member of the NFLCC and B.A.S.S.. He currently is employed by Coco-Cola Co. of Japan. Mr. Yasui said he has heard Mr. Wakabayashi speak of Mr. Harbin often. 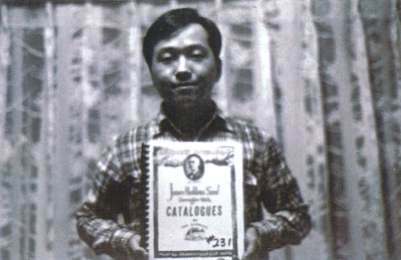 On October 31, 1980 Mr. Harbin air mailed a signed #231 copy of his James Heddon's Sons Catalogues book to Mr. Yasui. Mr. Harbin thanked Mr. Yasui for the wonderful gift he received of the "Koshu Kajikazawa" Japanese printing picture by the famous artist Mr. Katsushika Housai. Recently Mr. Harbin accepted an offer from Mr. Wakabayashi for him to visit Japan in August of 1981 and present his Bas-Tek-Neke and Ye Old Bass Lure Seminars to Japanese fishermen. Mr. Harbin was looking forward to meeting Mr. Yasui, Mr. Wakabayashi and whom ever was interested in bass fishing and old lure collecting. Mr. Yasui had Mr. Harbin's registered trade mark reproduced into a rubber stamp as a gift for Mr. Harbin. Mr. Harbin sent two copies of this newpaper article to Mr. Yasui. One was for himself and the second copy was for Mr. Wakabayashi. 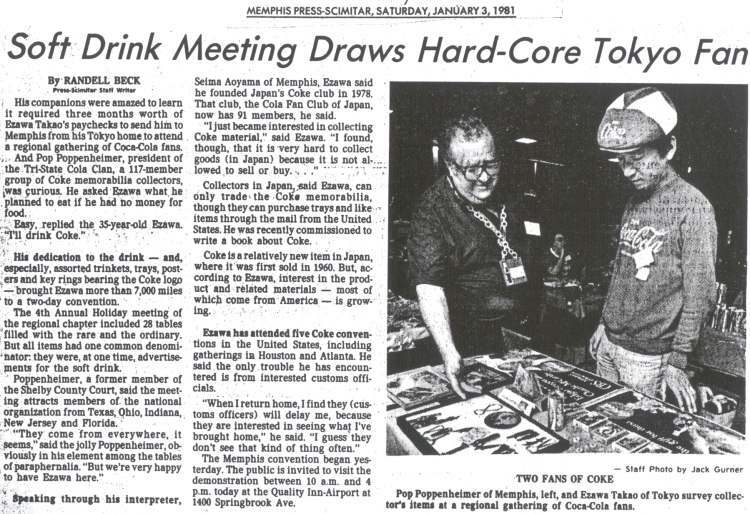 The article was about a Coco-Cola memorabilia collectors meeting that was held in Memphis, Tennesse. In 1982 the Coca-Cola Company in Japan was having their 25th Anniversary. Mr. Yasui saved the newspaper article he received from Mr. Harbin the prior year and they reprinted the entire article for the company's 25th Anniversary magazine. Mr. Harbin received a package from Mr. Yasui with some Coca-Cola Company's 25th celebrations souvenirs. There were many souvenirs inside a metal container that had an orange color inside the container. Mr. Harbin inquired about the metal container and Mr. Yasui explained that the large round container with the orange color inside was used to hold Japanese sealing ink. He said he would send Mr. Harbin a seal of The Bassman with their Friendship.